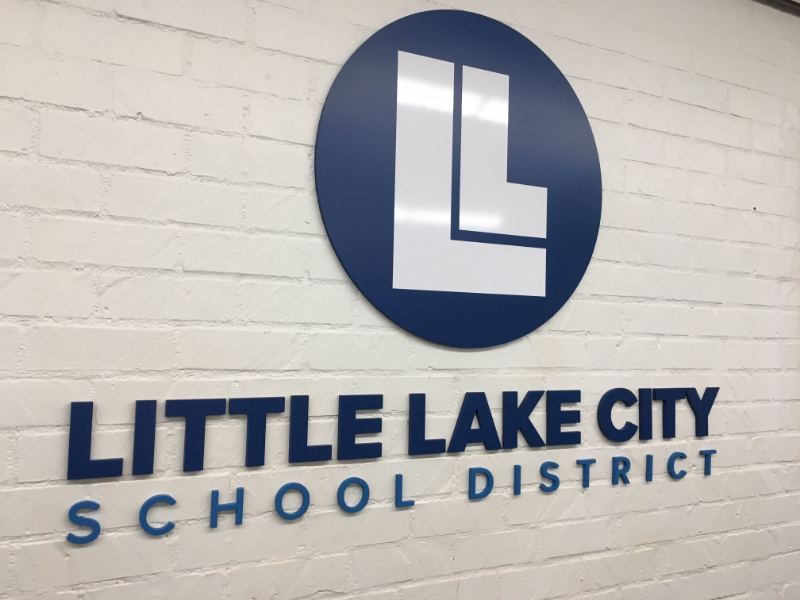 Located at 10515 Pioneer Boulevard, the Little Lake City School District serves two middle and seven elementary schools. When the administration updated its large conference room, a representative contacted our sign shop to provide the conference room signs and graphics in Santa Fe Springs, CA. Acrylic wall panels promote core principles! We worked with the administration to receive the specs for the project. Next, our technicians went out and took measurements. Doing so ensured that the signage would stand out without overpowering the dimensions of the room. We started with the creation of a large PVC lobby sign that becomes the focal point of the wall. It displays the district’s name and logo. With this sign in place, we created several clear acrylic panels that flank the product. 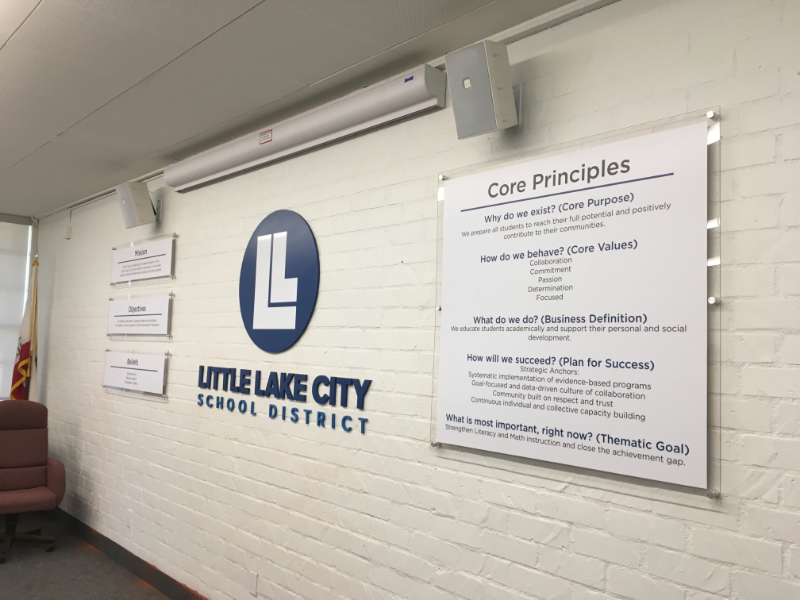 These feature imprinted vinyl overlays outlining the district’s core principles, mission, objectives, and beliefs. Technicians mounted them with brushed aluminum wall standoffs. The finished signage combination creates a professional setting in the room that sets the tone for meetings taking place there. 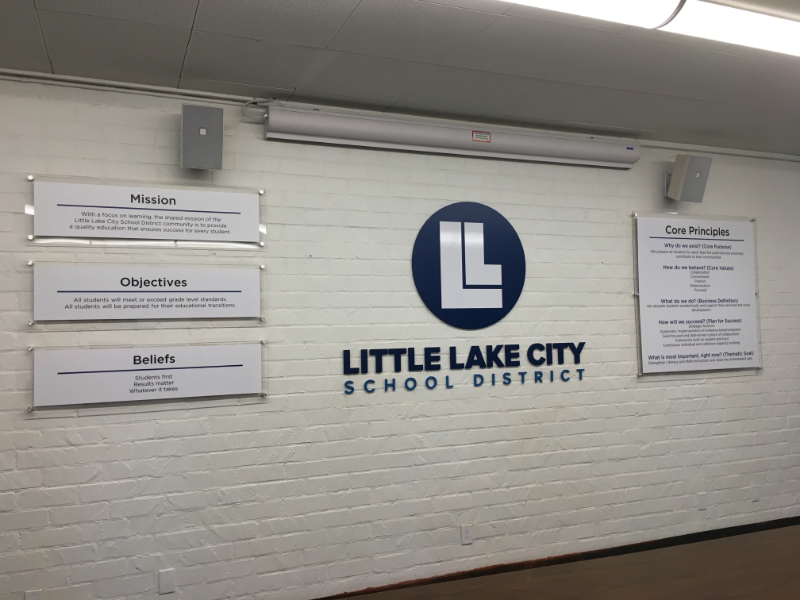 These acrylic wall panels reveal the school's mission, objectives, and beliefs! Superior Signs and Graphics works quite a bit with schools in the area. Administrators recognize that the right signage products can significantly support their goals of inspiring students to do their best. Pole flags. Parking lots typically have light poles. Use them to feature mounted flags that underscore the school’s colors, name, logo, and various attributes you want learners to focus on. Some administrators have had excellent success with emphasizing a growth mindset in this way. Gym graphics. The gym is the home of friendly rivalries between schools in the league. Give your home team the advantage with wall graphics that display the mascot, the school colors, and perhaps a tagline or two the coaches like to use. By having your team colors in place, your players feel at home immediately. Window and door wraps. What are the student learner outcomes you want parents, teachers, and students to focus on? Display them for all to see as window and door wraps. Our technicians can use perforated vinyl for the windows, which allows sunlight to come in. The 3D Letter PVC lobby sign complements the acrylic wall panels! 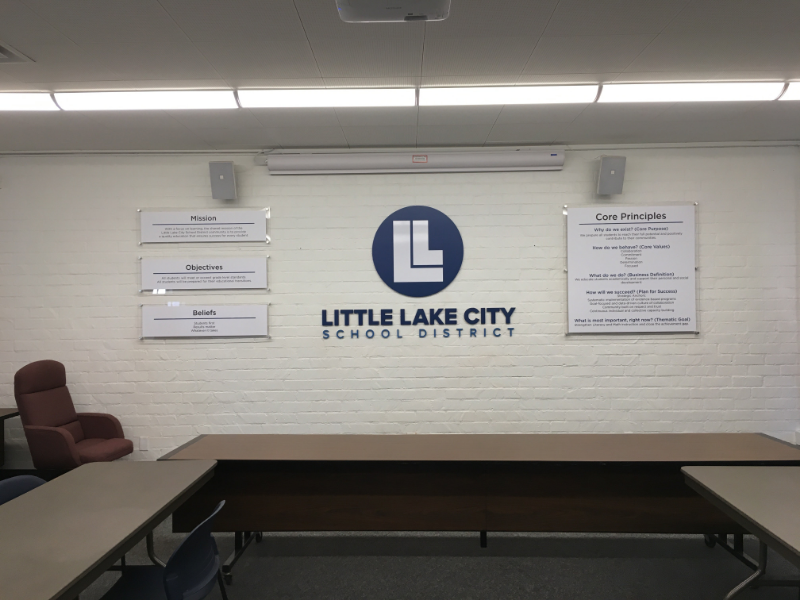 Take a page from the playbook of the Little Lake City School District, and feature your corporate values and goals on the walls of your conference room. When doing business there, customers and associates alike will focus on these words that guide the interactions. If you like, we can place a 3D lobby sign as the focal point of the wall space. It can mimic the signage that you have in the reception area. From there, we might use wall graphics, acrylic panels, or etched metal plaques to feature the values that you want to showcase in the space. If you do not yet have designs on hand, we can prepare them for you from the ground up. Discuss your plans with our signage specialists today to begin the design process. Superior Signs and Graphics serves the school districts and business communities in and around the areas of Orange and Los Angeles counties.